So you’re keen to try an English speaking lesson with a teacher on italki or some other site that offers online English lessons. Great! But you’re finding that fear or anxiety is holding you back. I felt like that too, and I hope that by sharing my story it will encourage you to give online lessons a try. Getting up the courage to speak English IS hard for lots of folks. Maybe you recognize the feeling. You want to speak English fluently. You know that the fastest way to get fluent is to actually speak. But you’re so nervous and worried about things not going well that you never actually do it. Not to be boastful, but I am a world-class badass at anxiety-based procrastination. You know me here in my role as a language teacher. But I’m also a language learner (of Dutch, at the moment). With my teacher hat on I’d be the first to tell you that to get better at speaking you have to, well, speak! And to be honest, I’d be (secretly) rather annoyed if you didn’t take my advice and start speaking as soon as you possibly could. But as a learner I would have a terrible time taking my own advice (even though I know it’s awesome). So I completely understand how you can desperately want to do something and still feel a crushing resistance to the idea of actually doing it. To learn, improve, and grow you have to push yourself beyond what is easy and comfortable. But not so far that you panic, please. Yes, fear is the reason I put off booking an italki lesson for an embarrassingly long time. I wanted to do it, needed to do it, intended to do it “someday.” But I was being held back by a whole army of irrational fears, mainly fears about looking and feeling stupid. Fears about having another person see how imperfect and unpolished I am. And to be absolutely frank, I didn’t want to put myself through the exhausting mental effort of actually having to SPEAK TO A REAL LIVE PERSON. It felt better to just keep on reading, listening, and practicing out loud to myself. Listening and reading (which I do a lot of) are easy and comfortable compared to speaking, by several orders of magnitude. No wonder so many English learners have trouble practicing their spoken English. Even if they have access to native speakers, they need to be brave enough to actually do some speaking! I finally found my courage on a day that I was feeling extra strong, motivated and energized. When your motivation is high, it’s best to do something hard that will set you up for future successes. I knew that getting my first lesson booked was the perfect “hard thing” for me to do that day. So I forced myself to go to italki, find a teacher, and book a lesson. That feeling of exhilaration lasted until a couple of hours before my lesson. It finally sunk in that I was really going to have to speak in Dutch for half an hour (or risk feeling like a failure). The anxiety and nerves came rushing back. But now that I had an appointment to keep. There was no way for me to chicken out and avoid the discomfort. To maximize my chances for success, I made sure to prepare for the lesson in advance. A couple of days before the actual lesson I chose a conversational situation to focus on. I did my best to imagine the kind of vocabulary and phrases I would need in this particular situation. Then I created a Google doc and wrote down all the vocabulary and phrases I could think of, and used the best grammar and vocabulary I could. I made notes of any areas where I was particularly uncertain, and wrote down some questions I wanted to ask my teacher. Finally I made sure to share the document with my teacher in advance so he would understand my goals, and so that we would both be able to type corrections, additions, and comments during the lesson. The day of the lesson came and I made sure to be ready on Skype a few minutes in advance. The ringtone sounded and there was no way back, so I took a deep breath and answered. I was super nervous (with sweaty palms and everything!) in the beginning, but was surprised to find that it didn’t last long at all. My teacher was super friendly, easy going, and had a great sense of humor. We spent the first few minutes just breaking the ice with basic “get to know you” conversation. Then we dove into the focus of the lesson. Our lesson was 30 minutes, and by the end I was exhausted from all the concentration and focus. But even so, the time just flew by. At my beginner stage I think an hour would have been too tiring for me. In fact, if I have one criticism of italki it would be that not many teachers offer 30-minute lessons. 60-minute lessons are great if you can concentrate for that long, but it would be nice to have the option of shorter lessons. I found that I enjoyed the feeling of the lesson being not quite long enough. That left me with plenty of energy to jot down my post-lesson notes and set up my flash cards to practice the tricky vocabulary and key phrases we had covered. I made sure to book my second lesson right away, while I was feeling motivated and inspired, and to keep me accountable for doing my language practice. 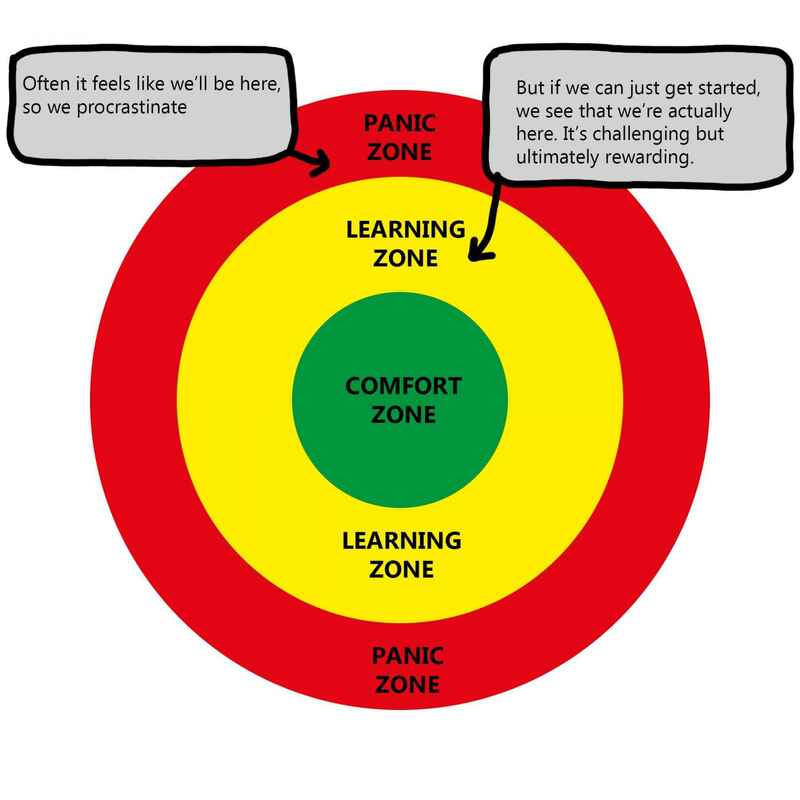 I thought I was in the panic zone, but once the lesson started I was in the learning zone. That sums up my first experience with a teacher on italki. There are free options for getting speaking practice as well, which can be a great start if you can’t afford to pay for a tutor or teacher. I’ve listed the best places I know for finding a speaking partner here.